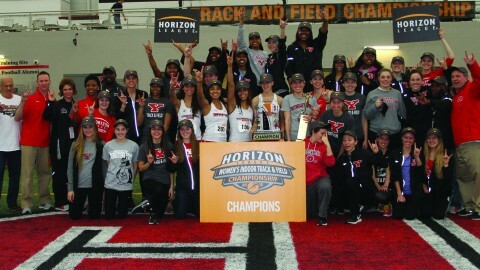 The Youngstown State University women’s track and field team won its second consecutive Horizon League Championship on March 1. Head coach Brian Gorby was named the Horizon League Women’s coach of the Year. Photo courtesy of YSU Sports Information. 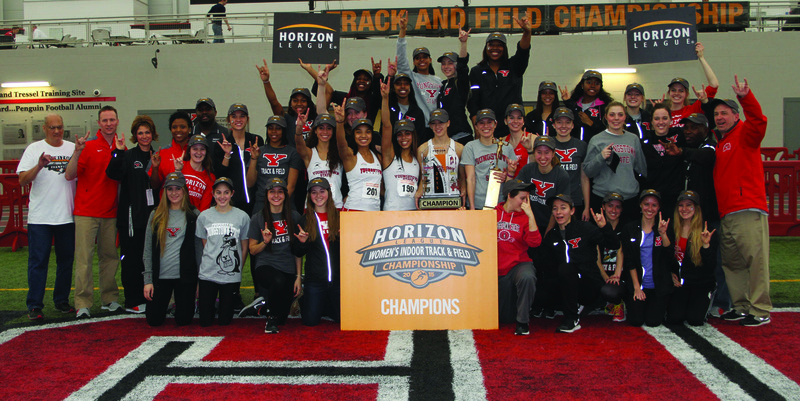 The Youngstown State University women’s track and field team won its second consecutive Horizon League Championship on Sunday, holding off the University of Wisconsin-Milwaukee Panthers to win the championship by one point (131-130). With only one event remaining, the 4×400 relay, YSU held a 123-120 lead over the University of Wisconsin-Milwaukee and needed a second place or better finish to win the championship. 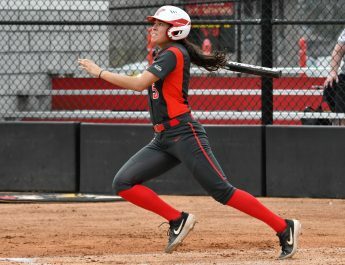 YSU head coach Brian Gorby made the decision to send sprinter Nina Grambling as the third leg of the relay, even though she had never run the 400-meter in a collegiate race before. The decision to run Grambling paid off, as she was able to pull away and give the Penguins a lead on second place in the 4×400 relay. Grambling also won the 60 and 200-meter dash and was named Outstanding Performer of the meet, along with Horizon League Track Athlete of the Year. Once Grambling gave the Penguins the lead, Jen Shiley, who won the Horizon League title in the 400-meter earlier in the day, took off from there securing the Penguins the Horizon League Championship. With a win in the Horizon League Championship and having won the Cross Country Championship earlier this year, the women have a chance to complete the Triple Crown in the Horizon League if they are able to win the outdoor championship later this spring. On the men’s side, it was also a battle between YSU and Milwaukee for the championship, but the men were unable to hold off Milwaukee in the 4×400 relay and fell short 161-154. The distance team stepped up big for the Penguins led by Austin McLean, Eric Rupe and Ryan Sullivan finished first, second and fourth respectively in the 3,000-meter race and picked up 22 team points, giving YSU a 1 point lead over Milwaukee heading into the final event. The Penguins, however, fell short in the 4×400 relay, coming in fifth place while Milwaukee dominated the event, securing their Horizon League Championship. “They are extremely tough. They’re great guys. They train so hard. It was just a friendly competition everyone’s out here having fun trying to do the same thing — just respect everybody,” McLean said. McLean had an outstanding performance throughout the championship weekend for the Penguins tying for the most points scored in the championship and was also named Horizon League Male Athlete of the Year. McLean won the conference title in the 1,600- and 3,000-meter race, and finished second in the 5,000-meter final on Saturday. “Honestly, I feel so blessed I don’t know what to even say about it. I just went out there and tried to help the team. Working with Eric we had all of these plans going in and obviously it seemed to work out decently well,” McLean said. Also winning awards for the Penguins was Conner Neu who was named as the Outstanding Field Performer, Ryan Booth who won Field Freshman of the Meet and Carl Zallow was named track freshman of the meet. Zallow was a force for the Penguins winning the conference title in the 60 and 200-meter dash.